Outdoor activities for all seasons. Birchwood and the surrounding area has many outdoor activities to choose from. Hike The Birkie Trail in Hayward, Snowshoe the Ice Age Trail or snow mobile the Tuscobia Trail in Birchwood. There are many golf courses to choose from. 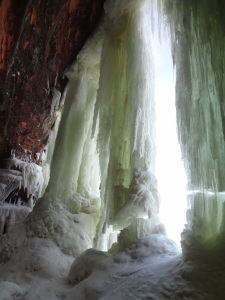 When staying multiple nights venture on up to The Ice Caves at Apostle Islands for a full day of exploring. Your possibilities are endless. The scenery is breathless. Whether you stay one night at The Cobblestone B&B or a week there are plenty of fabulous outdoor activities to keep you busy and healthy. These are just a few activities that Northern Wisconsin has to offer. Once you start to venture out you will see why The Birchwood/Hayward area is known as “God`s Country”. Hunt Hill usually has something fun to indulge in, like making your own set of snow shoes. If you choose water sports, Wisconsin has more than 10,000 lakes to choose from. For the little ones Hayward offers a unique petting zoo called Wilderness Walk. This is a big hit with the kids. After all this outdoor activity, you will truly look forward to coming back to The Cobblestone Bed and Breakfast for a nice massage in one of our unique tubs. A walk through Copper Falls and a soak in our Copper/Nickle tub can`t be beat. A must see for Winter Guest! more found on this site.